During the month of June, the city of Lisbon is transformed into a sardine wonderland. Really. An entire month of garlands, manjericos, pimba music (see our post about: Famous portuguese songs)...and sardines everywhere. The smell of roasted sardines invades Lisbon's oldest neighborhoods and the sardine image is hanged all around the city. Who draws those sardines? Anyone wanting to share some art. 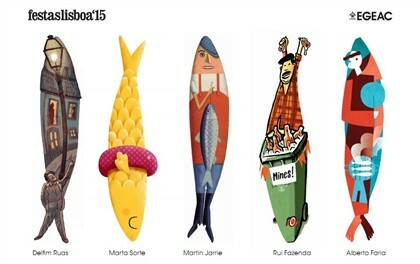 In fact, every year before the Festivities period (Festas de Lisboa, in June), Lisbon municipality's public enterprise for cultural animation, called EGEAC, launches a very interesting initiative: an open contest to create the image of the sardines that will be used as part of the Festas de Lisboa's campaign and will be hanged to be admired by everyone both around the city and in a museum. There is no theme and you can draw your sardine, paint it, sew it, make a video...be creative! What is good for you, dear readers, is that this contest is open to all Portuguese and foreign, resident and non-resident in Portugal meaning you can send proposals directly from your country! If you have saudades, that's a good way to feel better and get connected with these amazing festivities! You can submit a maximum of three sardine proposals and the deadline for submission is 16th of March 2016! Click here to access the contest page!